At the March installation meeting of Newton Lodge No 6288, the brethren assembled to witness the installation of Lee Marsh into the chair of King Solomon. 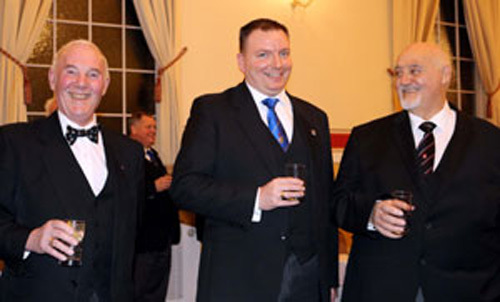 Pictured from left to right, are: Charles Carr, Lee Marsh and Gordon Archer, being toasted at the social board. Installing master Gordon Archer opened the lodge in his own inimitable style. He then guided the lodge through routine business and thanked the brethren of Newton Lodge for their wonderful support during a difficult year. 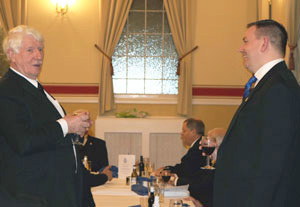 Gordon welcomed Assistant Provincial Grand Master Kevin Poynton, accompanied by grand officers Dennis Rudd, Jack Forsyth, Stan Churm, Chris Eyres, Malcolm Alexander (East Lancashire) and acting Provincial grand officers; Ian Halsall, Robert Williams, Leslie Savage, Howard Savage and Jozef Markisz (East Lancashire), to their installation meeting. Bob Armstrong was asked if he would occupy the chair of SW, Peter Barton if he would occupy the chair of JW and Alan Greggs if he would act as IG for the installation. Each accepted with pleasure. Lee was then presented for installation by Dave Whitmore and the ceremony proceeded seamlessly. The third degree working tools were presented by Ben Whitmore (one of the junior brethren); the second degree working tools were presented by Dave Whitmore (Ben’s father) and the entered apprentice working tools were given by Gordon Watkinson. All performed well. Addresses were given by Chris Eyres to the WM, to the deacons by Norman Pritchard, to the stewards by Howard Savage, to the tyler by Stan Churm, to the IG by Alan Greggs and to the brethren of the lodge by Kevin Poynton. Lee added his personal thanks to the outgoing IG John Walsh for the last four years of service in the role. The principal guest, Kevin, was presented with charitable donations for the sum of £870 to the MCF 2021, £200 to Ecclesholme, £200 to Newton Community Hospital and £130 to Warrington Masonic Hall, a grand total of £1,400. If this excellent sum was not enough, the collection in the lodge raised £124 and a further £164 was raised by a raffle at the social board, for the lodge charitable funds. A good night for charity. Norman Pritchard (left) toasts Lee Marsh during the master’s song. After the meal, Kevin gave a speech emphasising that the Grand Master will this year be achieving 51 years in office. He thanked the lodge, small in number but big in heart, for such impressive charitable donations, he gave personal thanks to the acting Provincial grand officers who had attended him at the meeting and gave a special thanks to Chris Gleave and John McIntyre for the excellence of the support team in Warrington. In addition, Kevin made a point of celebrating the work of Charles Carr, as acting DC, Keith Dickinson as organist and the work of the publicity team. Finally, in an impassioned ending to the speech, he echoed the sentiment of ‘Enough is Enough’ to the negative press coverage in recent years. Perhaps, he added, these critics should take note of the abundant, unsung help of Freemasonry to charities, both in the UK and around the world. Gordon Archer gave a speech listing the many, many talents and achievements of the new WM, among which are motorcyclist, musician, golfer, advanced motorist, St John Ambulance member of very high repute, lay minister and now studying for a degree in theology; a true Renaissance man. The master’s song was sung, excellently, by Norman Pritchard, well accompanied by Keith Dickinson, who also provided the first-rate music in the lodge. Another good night spent in the company of Newton lodge. Pictured from left to right, are: Howard Savage, Robert Williams, Chris Eyres, Stan Churm, Gordon Amos, Lee Marsh, Kevin Poynton, Dennis Rudd, Les Savage, Malcolm Alexander, Chris Gleave and Ian Halsall.